Opposites really do attract, especially in our kitchen! We combine unexpected flavors that melt together to create ironically delicious desserts. 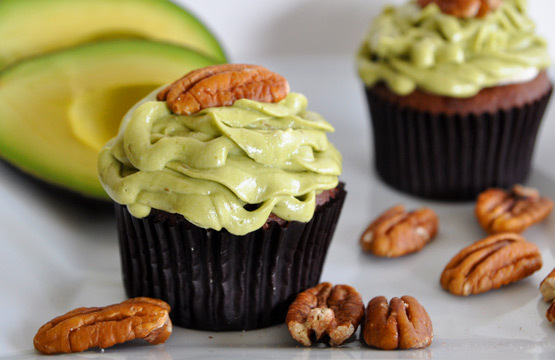 This week’s featured cupcake is the Avocado Chocolate cupcake. Its strange combo of flavors will kick your taste buds into fiesta mode! Our newest cupcakes are Bacon Me Crazy and Jalapeño So Spicy. Smells Like Bakin’ started out in the garage of the husband wife duo Allison & Joseph. Allison is the baker, and Joseph found a way for them to make a business out of her tasty treats. Flash forward to today and they have a successful store front, catering business and cupcake truck. We announce all of our new flavors first through Facebook & Twitter, and even take requests! © 2012 Smells Like Bakin' Cupcake Company. All Rights Reserved.